I've decided to take the plunge and put our daily happenings on the web! Come see what Maddux and Hannah are up to! Here are some recent pics....more to come soon, I promise! So here are some more comparison pictures. They were taken around a month old. Here is Maddux before he had his "social" smile. And here is Hannah at about one month also before she truely had her "social" smile. Here is Maddux at about 2 weeks getting dressed after a bath. Here is Hannah on the floor relaxing after a bath at about 3 weeks. New pictures to come sooon! A few weeks before Hannah arrived Lisa and I took the boys down to the Fredericksburg Fire Station. It was a blast, the boys all had a great time! They got fire hats, dalmatian dogs, and coloring books and the firemen were great with them! The picture below cracks me up, I think Maddux would have been fine if he had seen the firemen get dressed up, they just appeared out of nowhere and he was a bit freaked! This would have been great if his eyes had been opened. The boys posing for a shot in the fire truck! Maddux driving the fire truck, he liked the big steering wheel. Maddux at about 2 weeks. Hannah at about a week. So here are some pics to compare Hannah and Maddux when they were born. The resemblences are amazing! Here is Maddux a few days old. And here is Hannah a few days old. We had a blast at the Sansone's in Madison. Maddux loved being in the water! Great food, Great fun, and Great company! Here are some pictures of Maddux meeting Mia, the foal that Kathy and I own. I love these pictures I took at Hurkamp Park during the concert in the park series. He looks like a little boy, he's not my baby anymore! Showing off Daddy's fish he caught at the river. Look it's almost as big as me! 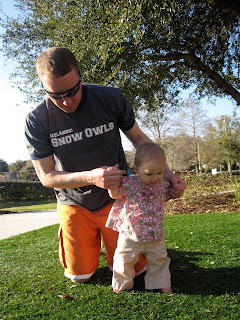 Hanging out at the sandbox with Daddy! Maddux loves the water! Here are some pictures of the boyer boys and Maddux playing in the water together! He loves to put his face in the water! I need to get the kid some swim lessons! So after church Maddux ate lunch and then he got a visitor from the easter bunny. The easter bunny left him a trail of eggs to find leading up to his easter bucket. He is a great egg finder! Here is his easter bucket! He got some plastic animals, a big bubble maker with lots of bubble juice, some color wonder markers and coloring book and a chocolate egg. He loved his basket!